Show your hard-working parents how much you appreciate all they do with these retro-styled signs. When it comes to your love for dear old mom and pop, you mean business. 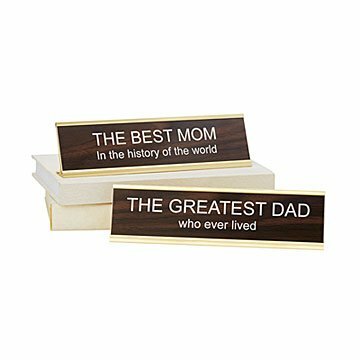 Show your hard-working parents how much you appreciate all they do with these retro-styled signs that proudly declare that they're the "best ever." Made in Covina, California and St. George, Utah. It said it might not ship until June 21st, but it came waaaay earlier! It was a nice surprise. It was in great condition, and great quality. My dad loves it!! He has a home office so he put it on his desk and is very proud of it. Perfect timing! I was desperately seeking a last minute, and unique, house warming gift. My best friend & her husband were thrilled to receive it. Flawless Victory. I got the Best Mom Ever desk sign for my Mom this past Christmas. When she opened it, she happy cried. I would say that's a good sign. The package was delivered quicker than I thought. An all around wonderful experience. My daughter picked this out as a Christmas gift. I think everyone was pleased by the item. Got this for my dad and he enjoyed it. Fun twist on retro-style office desk signs.